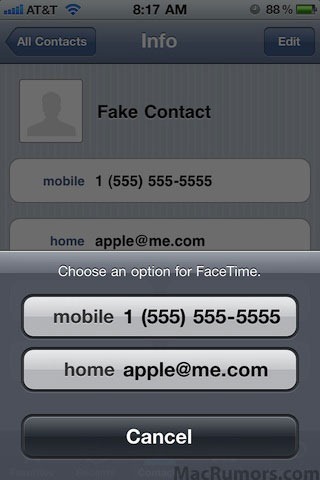 A new option in the iOS "Contacts" application allows users to make FaceTime calls using either a phone number or an email address. This would allow FaceTime compatibility with devices not associated with a phone number such as future camera-enabled iPads and iPod touches. So there you go! this if anything hints towards a strong possibility of next-gen iOS devices like iPod touch 4 / 4G and the next iPad featuring a front-facing camera for FaceTime video calls across all the iOS based devices. iPod touch 4 / 4G at least can be expected to be unveiled at the upcoming Apple Media Event in September of this year. Wait. Does it send an email or only “locate” the other device? How could you locate a device with an email? Are they stalking us? I'm guessing that this update will allow Facetime on the rumored iPod & iPad.